Parathyroidectomy is the removal of one or more parathyroid glands. A person usually has four parathyroid glands, although the exact number may vary from three to seven. The glands are located in the neck, in front of the Adam's apple, and are closely linked to the thyroid gland. The parathyroid glands regulate the balance of calcium in the body. Parathyroidectomy is usually performed to treat hyperparathyroidism (abnormal over-functioning of the parathyroid glands). The number of parathyroidectomy procedures has risen due to routine measurement of calcium in the blood. Incidence rates vary between 25 and 50 per 100,000 persons. The number of procedures in females is approximately twice that of males. The incidence of parathyroidectomy rises after age 40. The operation begins when an anesthesiologist administers general anesthesia. The surgeon makes an incision in the front of the neck where a tight-fitting necklace would rest. All of the parathyroid glands are identified. The surgeon then identifies the diseased gland or glands, and confirms the diagnosis by sending a piece of the gland(s) to the pathology department for immediate microscopic examination. The diseased glands are then removed, and the incision is closed and covered with a dressing. Parathyroidectomy patients usually stay overnight in the hospital after the operation. Some patients remain hospitalized for one or two additional days. Prior to the operation, the diagnosis of hyperparathyroidism should be confirmed using lab tests. Occasionally, physicians order computed tomography scans ( CT scans ), ultrasound exams, or magnetic resonance imaging (MRI) tests to determine the total number of parathyroid glands, and their location prior to the procedure. Parathyroidectomy should only be performed when other non-operative methods have failed to control a person's hyperparathyroidism. Preparation is similar to other surgical procedures requiring general anesthetic. The patient is not allowed any food or drink by mouth after midnight the night before surgery. He or she should ask the physician for specific directions regarding preparation for surgery, including food, drink, and medication intake. The incision should be watched for signs of infection. In general, no special wound care is required. The calcium level is monitored during the first 48 hours after the operation by obtaining frequent blood samples for laboratory analysis. Most individuals require only two or three days of hospitalization to recover from the operation. They can usually resume most of their normal activities within one to two weeks. 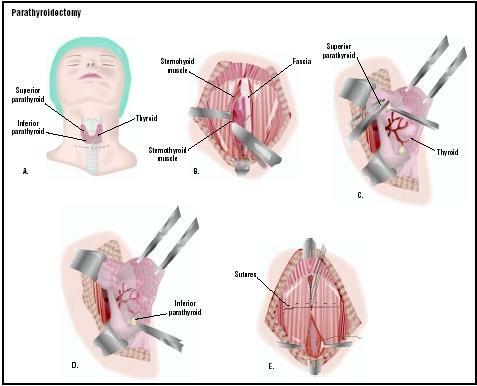 The major risk of parathyroidectomy is injury to the recurrent laryngeal nerve (a nerve that lies very near the parathyroid glands and serves the larynx or voice box). If this nerve is injured, the voice may become hoarse or weak. Occasionally, too much parathyroid tissue is removed, and a person may develop hypoparathyroidism (under-functioning of the parathyroid glands). If this occurs, he or she will require daily calcium supplements. In some cases, the surgeon is unable to locate all of the parathyroid glands, and cannot remove them in one procedure. A fifth or sixth gland may be located in an aberrant place such as the chest (ectopic parathyroid). If this occurs, the hyperparathyroidism may not be corrected with one operation, and a second procedure may be required to find all of the patient's remaining parathyroid gland tissue. The surgery progresses normally if the diseased parathyroid glands are located and removed from the neck region. Hematoma formation (collection of blood under the incision) is a possible complication of any operative procedure. However, in procedures that involve the neck it is of particular concern because a rapidly enlarging hematoma can obstruct the airway. Infection of the surgical incision may occur, as it may in any operative procedure, but this is uncommon in parathyroidectomy. Before the function of the parathyroid gland was understood, people undergoing a thyroidectomy often died due to the lack of calcium in their blood caused by removal of the parathyroid glands. This is not a problem today. There is no safe or reliable alternative to removal of the parathyroid glands for the treatment of hyperparathyroidism. Oral phosphates can lower serum calcium levels, but the long-term use of this approach is not well understood. Bilezikan, J.P., R. Marcus, M. Levine. The Parathyroids 2nd Edition. St. Louis: Academic Press, 2001. Bland, K.I, W.G. Cioffi, M.G. Sarr. Practice of General Surgery. Philadelphia: Saunders, 2001. Randolph, G. Surgery of Thyroid and Parathyroid Glands. St. Louis: Elsevier, 2002. Schwartz, S.I., J.E. Fischer, F.C. Spencer, G.T. Shires, J.M. Daly. Principles of Surgery 7th edition. New York: McGraw Hill, 1998. Townsend C., K.L. Mattox, R.D. Beauchamp, B.M. Evers, D.C. Sabiston Sabiston Review of Surgery 3rd Edition. Philadelphia: Saunders, 2001. Awad, S.S., J. Miskulin, N. Thompson. "Parathyroid Adenomas versus Four-gland Hyperplasia as the Cause of Primary Hyperparathyroidism in Patients with Prolonged Lithium Therapy." World Journal of Surgery 27, no.4 (2003): 486-8. Genc, H., E. Morita, N.D. Perrier, D. Miura, P. Ituarte, Q.Y. Duh, O.H. Clark. "Differing Histologic Findings after Bilateral and Focused Parathyroidectomy." Journal of the American College of Surgery 196, no.4 (2003): 535-40. Goldstein, R.E., D. Billheimer, W.H. Martin, K. Richards. "Sestamibi Scanning and Minimally Invasive Radioguided Parathyroidectomy without Intraoperative Parathyroid Hormone Measurement." Annals of Surgery 237, no.5 (2003): 722-31. Miccoli, P., P. Berti, G. Materazzi, G. Donatini. "Minimally Invasive Video Assisted Parathyroidectomy (MIVAP)." European Journal of Surgical Oncology 29, no.2 (2003): 188-90. American College of Surgeons. 633 North St. Clair Street, Chicago, IL 60611-32311. (312) 202-5000, fax: (312) 202-5001. http://www.facs.org , E-mail: http://postmaster@ facs.org. Association of Thyroid Surgeons. 717 Buena Vista St., Ventura, CA 93001. Fax: (509) 479-8678. http://info@thyroidsurgery.org. Columbia University Medical Center. [cited May 5, 2003] http://cpmcnet.columbia.edu/dept/thyroid/parasurgHP.html . Mayo Clinic. [cited May 5, 2003] http://www.mayoclinic.org/checkup/02mar-parathyroid.html . Ohio State University. [cited May 5, 2003] http://www.acs.ohio-state.edu/units/osuhosp/patedu/Materials/PDFDocs/surgery/thyroid.pdf . University of California-San Diego. [cited May 5, 2003] http://www-surgery.ucsd.edu/ent/PatientInfo/th_parathyroid.html . University of Wisconsin. [cited May 5, 2003] http://www.surgery.wisc.edu/general/patients/endocrine.shtml . L. Fleming Fallon, Jr., M.D., Dr.PH. Parathyroidectomy is an operation performed most commonly by a general surgeon, or occasionally by an otolaryngologist, in the operating room of a hospital. What type of physician performs the surgery? How many parathyroidectomy procedures has the surgeon performed? What is the risk of complication? How will the body's function change after the surgery? Why would a surgeon remove lymph nodes during a parathyroidectomy? Scheduled for parathyroids to be removed. will the neck scare fade away or will it be a big keylode thick ugly scare or can small holes be made in the neck instead. i am very concern about how my next will look after the surgery. I had surgery on Aug 31 2010 I am happy I did. Unfortunately my doctor had to remove 21/2 infected glands. But I feel much better. Before surgery felt like there was a mass on my lower back it was making my posture bad seem like it was making my spine curved. Also, there was a mass growing on left side of stomach a small knot inside for 7 years it seems to be gone. The Neuroma around my toes seem to be gone. I am thankful I had this procedure done. I had one gland removed ten days ago and I am so glad I did. I broke my back two years ago and the pain, although fixed, never went away and just increased as so did the bones in my legs and arms (osteoporosis) within hours after the op the pain in my back stopped and have not felt it since, nor in my arms and legs. I felt a bit woozy after the anaesthetic but different. Somehow emotionally I feel a lot stronger and my energy levels have increased - which is amazing as I had chronic fatigue. I know in the articles they say there are very few symptoms - well I had quite a few of them and they are all getting better. I am beginning to have a quality of life that I have not had for years (it took over 7 years to be diagnosed with this illness - even though my calcium levels then were starting to be a little bit high it just increased over the years and it was the cardiologist who discovered it as I had high blood pressure and they could not work out why it was high when my heart was okay, my cholesterol levels were excellent, my diet is healthy (not overweight) took up meditation and tai chi but none of this was helping until the removal of the tumour. Had parathyroid surgery that was a complete disaster. Surgeon took out lymph nodes and thymus gland after finding all four parathyroid glands in my neck and removing two that were abnormal. No tumor was found in my chest or my thymus gland. All normal parathyroid glands were destroyed so that I have no more Parathyroid Hormone and the surgeon destroyed my laryngeal nerve so I have a paralyzed vocal cord and little remaining voice, painful when I speak and typically others cannot hear me. to us. Had temporary procedure on my vocal cord, a filler substance was injected into my paralyzed vocal cord under general anesthetic, a difficult experience and cost many times greater than the Parathyroidectomy. I am being monitored by an endocrinologist for hypoparathyroidism, I'm seen every three months and need to have frequent blood draws as well as taking pills twice a day. The general surgeon was highly recommended, if only I had known that I needed to go to an expert endocrine surgeon. The surgeon I had was obviously inexperienced and had no idea what he was doing. He said not one word about complications and brushed off my questions when I asked about the number of parathyroid surgeries he had done. I misinterpreted his blustery over-confidence that had nothing to do with his level of expertise or experience.